Meet Dr. Kim Logan-Nowlin: Kim Logan-Nowlin, Ph.D., LPC, BCPC, ACAC, IAMFC, MFT, AAFLP or “Dr. Kim,” as she is affectionately called by audiences, is a dynamic speaker who always leaves her audience spellbound. As President of Kim Logan Communications for over 30 years, she has trained and counseled people from all walks of life to be INSPIRED and how your words can change your choices and your life”. She holds a Bachelors of Science Degree in Special Education, Masters of Arts Degree in Family and Guidance Counseling, and a Doctorate of Philosophy Degree in Oral and Interpersonal Communication and Clinical Family Counseling. Book Talk: Dr. Kim Logan-Nowlin and Arthur Nowlin shared inspiration behind the books they authored in this playlist. Each book has a unique beginning. These books are very personal for them. Some of them are their own personal stories and some stories of others. 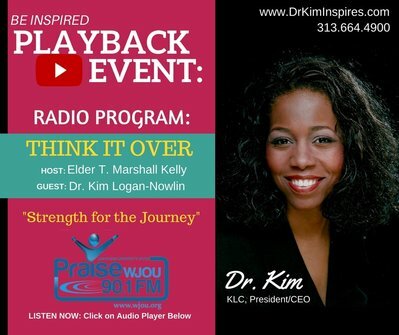 Dr. Kim Speaks: Dr. Kim is a gifted woman on a mission to help others discover their gifts. As a national inspirational and motivational speaker, she gave encouragement, direction, hope and healing to thousands of all ages each year. This playlist has some of her speaking engagements at various locations. Message to BAYDA Youth Congress 2016: Dr. Kim will be presenting her personal story about sin, life, love, and God's forgiveness. The three workshops will focus on being stuck in unforgiveness, being left behind without ever knowing forgiveness and being lost because one never had the faith to accept God's forgiveness. Workshops by Dr. Kim: This playlist contains previews for workshops by Dr. Kim Logan Nowlin. Dr. Kim introduced in these videos what you would expect in some of her workshops. Book Talk: Mr. Arthur Nowlin LMSW shared inspiration behind the book he authored title " Marriage: Living the Unexplainable". Mr. Nowlin talked about how different things effect marriage and what must couples do to keep their marriage alive and thriving. Making It Work Season 4: This program aired on Dare to Dream channel of 3ABN. In this program Dr. Kim Logan-Nowlin and Arthur Nowlin interviewed many people that went through extraordinary journeys in their lives. Nowlins also share some crucial advise in leading our lives when we face daunting challenges in life. Season 4 aired in 2015. Season 4 playlist has 12 episodes. Making It Work Season 2: This program aired on Dare to Dream channel of 3ABN. In this program Dr. Kim Logan-Nowlin and Arthur Nowlin interviewed many people that went through extraordinary journeys in their lives. Nowlins also share some crucial advise in leading our lives when we face daunting challenges in life. Season 2 aired in 2014 and has 13 episodes. ​Making It Work Season 1: This program aired on Dare to Dream channel of 3ABN. In this program Dr. Kim Logan-Nowlin and Arthur Nowlin interviewed many people that went through extraordinary journeys in their lives. Nowlins also share some crucial advise in leading our lives when we face daunting challenges in life. Season 1 aired in 2013 and has 13 episodes. Teasers: Dr. Kim Logan-Nowlin and Arthur Nowlin serve as the co-hosts of Making It Work Television program on Dare to Dream channel operated by Three Angels Broadcasting Network . This playlist contains teasers for upcoming TV programming.